Finally, after several years of searching I've the elusive evergreen Dogwood 'Empress of China'. This Dogwood is quiet remarkable, apart from the claims of it being an evergreen the flowers are heavily profuse and displays for a prolonged period. We've had the trees in stock for the last 3 weeks, delivered covered in buds which have now opened into a glorious flowering tree. I've been told to expect the flowering to last for up to 6 weeks and this looks possible! To top it off its the last of the Dogwoods to bloom, extending the total bloom time from Cornelian-cherry Dogwood (Cornus mas) starting in March, to our native (Cornus florida) and then the Asian Dogwood (Cornus kousa) ending with this one in June. Until recently it was only available from Wayside Gardens, a mail order nursery based in South Carolina, though it managed to escape into some mainstream nurseries. The benefit is that larger plants can now be supplied as you have to limit the size of the plant when shipping through the mail. 'Empress of china' was a selection made by John Elsley , Director of Wayside back in 1992 from some 2-3 year seedlings and after trials applied for a patent application in 2002. The original species was only introduced for the first time in the U.S. in 1980 from a collection made by Ted Dudley of the U.S. National Arboretum. 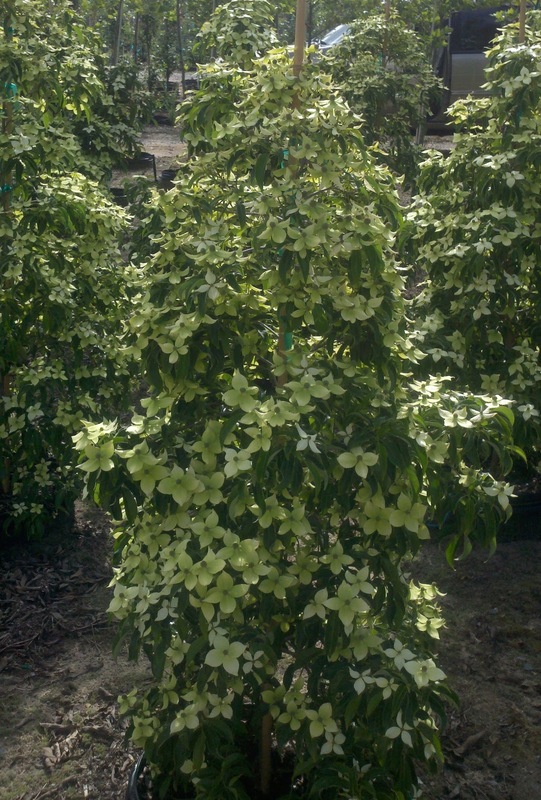 It takes a long time for new tree cultivars to come to market unlike perennials that can be turned and burned in a shorter period. Proven to be a reliable evergreen in the south with good vigor and sets a heavy bloom, so thick you don't see the tree through the flowers. Small strawberry like fruit are produced in place of the spent blooms that's a favorite of songbirds in late summer. Foliage is said to remain on the tree through the winter and shed in spring to keep it fresh and never naked but some growers claim that it may not be the case for us further north from the Carolina's. Either way it has lots of redeeming features that won't disappoint us in the garden. 'Empress' has shown to tolerate the heat and humidity in the south, however requires a break from afternoon sun. I've found most Dogwoods are sensitive to the high heat and drought conditions in summer where there swallow roots can bake when exposed to afternoon sun. However, too much shade will create a drop in flower production and prevent it living up to its full potential. Just like azaleas, it will flower best in full sun but finding that balance of filtered light can be a challenge. At the end of the day it doesn't change the price of gas to concern us that much, but interesting to see how it can hide away from sight. I for one will be trying to find a place in my garden for it to live as long as I can seek it past the minister of finance (being the wife) who will probably bust me for yet another garden expense! We have them at the place I work, Merrifield garden center in northern Virginia. I brought them in from a grower last year, in both a 7 and 15 gallon size but only have 15 gallons available at this time. Fingers crossed, I should have the smaller size in spring. Hopefully you live nearby to come and have a look. Sorry, don't have a source for liners, but I do have some 15 gallon trees if you're in the Virginia area.